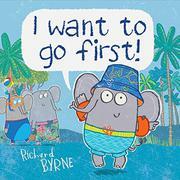 On their way to the nature reserve’s watering hole, Elphie, the littlest elephant, wants to move to the front of the line and so enlists readers to help. Byrne’s interactive approach finds his main character addressing readers in an effort to disrupt the other elephants’ places in line. “Hey, readers! I have an idea. On the count of three, shout out ELEANOR! / Ready? 1…2…3…” Eleanor, hearing her name, steps aside to investigate, and Elphie moves up in line. “Thank you, readers. I’m not last anymore!” As the group continues their trek, Elphie asks readers to hiss like a snake so one frightened friend jumps aside and “to please give the book a good shake,” causing another to be too nervous to cross a wobbly bridge. But when readers are asked to squeak, growl, or roar, Elgar, the biggest, is not fooled. Black-outlined cartoon figures with round eyes and gray bodies in bright swim attire enact the sequence of events told in large, black text and dialogue bubbles. Elphie’s polite request for readers’ assistance works to scare off a large, selfish elephant who is dominating the waterhole, earning a place in front on the way home. Although the overall gimmick is amusing, readers may feel this reward is at odds with Elphie’s fundamentally sneaky behavior.